Customer feedback module SH45 - Q-net Internatinal Ltd. In order to improve the quality level of the service of any company that is receiving visitors, customers it is indispensable to use at least one way of a customer feedback solution. 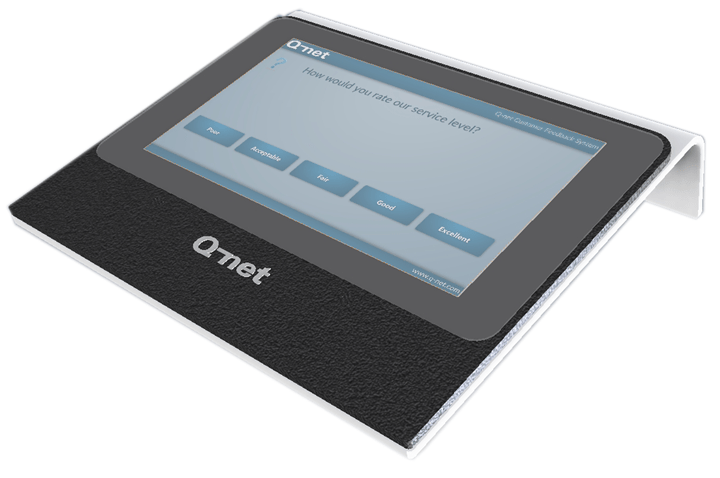 Q-net Pro offers this module: when the transaction is over the clerk will finish the transaction on the hardware / software keyboard and the question(s) will appear on a dedicated device (CF04) that is installed at the counter and the customer can answer by touching the right button / value. The question will appear on that language that was selected at the ticket dispenser and on which the ticket was printed. We offer a solution for those end users that wish to use only 1 device in 1 branch. This is obviously an inexpensive way, but the customers usually want to give their opinion only if they are not really satisfied. In this case they should find the same CF04 unit (desktop) or its alternative on stand: CF05. The customer should select a language, add the ticket number and answer the question. Unfortunately this cannot be the precise solution as not every customer would stop for this process at leaving the office.